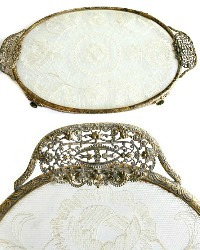 Exquisite Gold Plated Vanity or Boudoir Tray, with beautiful French Net Lace in a floral pattern underneath the glass. Rare to find these days with the lace so pristine as inside this tray. So elegant, has intricate French style feet to stand on, and ornate filigree handles. 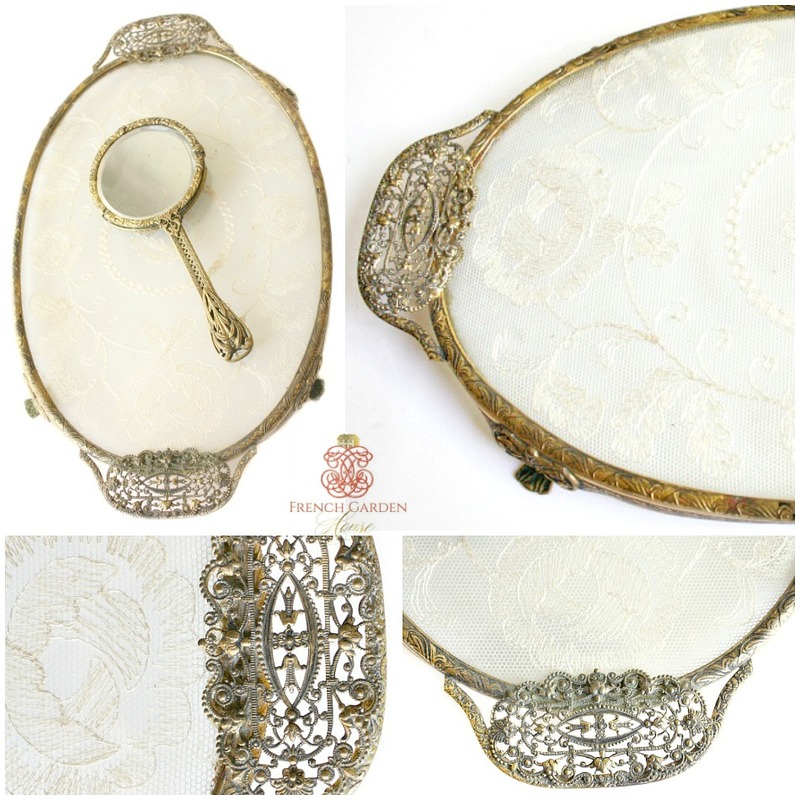 Stunning, romantic, classic and feminine, this tray will display your antique French perfume bottles, or your collection of enameled patch or pill boxes beautifully! Unmarked, but most likely by Apollo, judging from the quality of the work. These gilded accessories were meant to emulate the ormolu pieces of the early 1800's. There is some darkened patina to the gilt as would be expected of a decorative tray of this age. 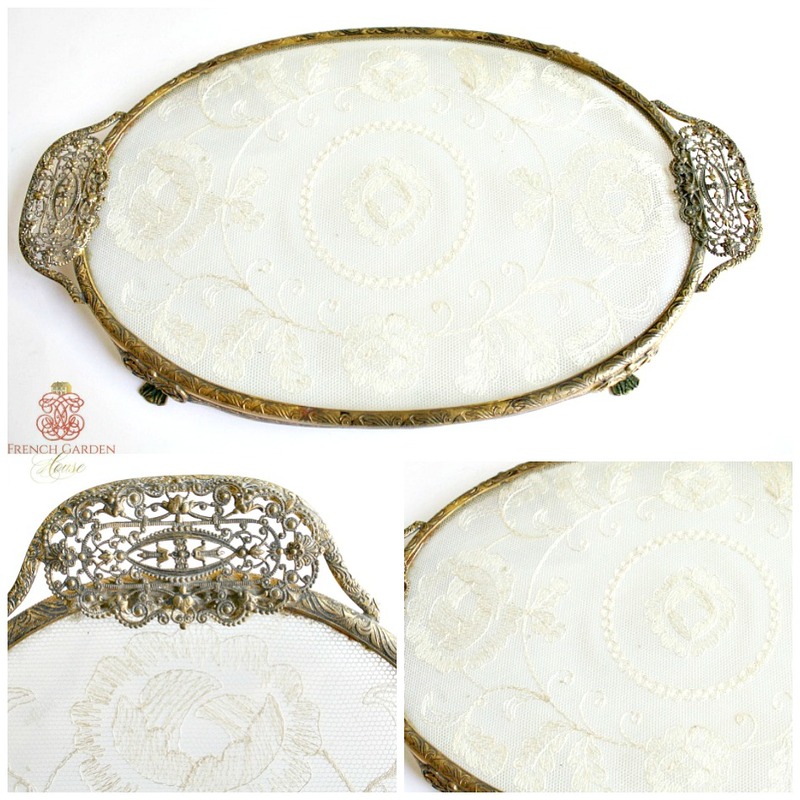 The tray is in good condition, display this in your bedroom, your dressing room, your bathroom, or anywhere else where you want to add a touch of glamour! Has an aged patina, the grace of time, and the frame is slightly out of oval at places, it stands well. I've taken this into account with the pricing. Measures 14-1/2" x 8-1/2" x 1"h.